HOLLYWOOD — Seminole Tribe of Florida small business owners were recently reminded of some big economic opportunities that are currently in South Florida and on the horizon. 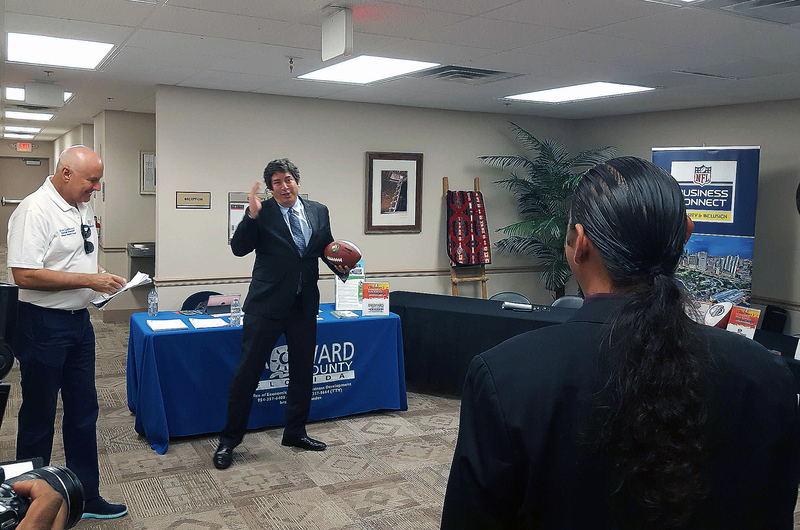 At the Chairman’s Economic & Small Business Development Seminar, officials representing the upcoming Super Bowl in Miami, and Broward County Mayor Mark Bogen, laid out ways Tribal businesses can grab a piece of what they say is a big pie. The first-of-its-kind seminar took place March 1 at the Native Learning Center in Hollywood. It was organized by Derrick Smith, senior director of operations in the Chairman’s office. Smith said the main reason for the event was simply to promote the growth of Tribal businesses. Bogen started out praising the Seminole Tribe’s ongoing contribution to the county’s strong economy to the roomful of attendees. But this seminar was about business opportunities outside of the Hard Rock’s operations. Bogen let the attendees (which included a couple Tribal caterers and a construction company owner) know how they could do business as a vendor with the county. He stressed that businesses must first go through a registration process to be an official vendor. “Eligible contractors in Broward have to use 25 percent of small businesses as part of their contracts,” Bogen said. Bogen added that the recent “penny tax” for public transportation projects that voters recently approved will generate even more opportunity for small businesses in the future. Sandy McDonald, the director of the Office of Economic and Small Business Development at Broward County, spoke to the group and said his office was available to answer questions or provide any assistance. The programs throw around a lot of acronyms – CBE/SBE and DBE/ACDBE to name a few. But the bottom line is they amount to local and federal certification programs through the county, as well as free small business assistance and other opportunities. Broward is currently the 15th largest county in the U.S. with an annual budget of $5 billion. Most Tribal members already know that Super Bowl LIV (54) will be played at the Hard Rock Stadium in Miami on Feb. 2, unleashing thousands upon thousands of visitors to the area. But what might not be immediately clear – especially for small Tribal businesses – are the local economic opportunities that come with hosting an event of this size. 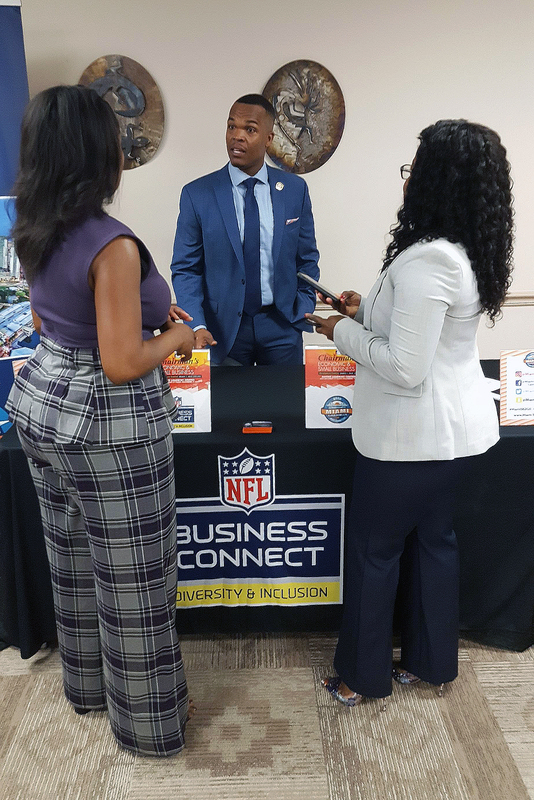 Rashad D. Thomas, the vice president of Business Connect for Miami Super Bowl 2020, outlined a way for Tribal small businesses to connect with National Football League (NFL) partners in its Business Connect program during the run up to the Super Bowl. The program launched Nov. 8 and is a program of the NFL that promotes diversity and inclusion of small business owners. For a business to participate, it must be at least 51 percent minority owned. The designation is for any minority, including Native American, women, LGBT (lesbian, gay, bisexual, transgendered) or veteran. In short, it’s a way to position a small business to access contracting opportunities related to the Super Bowl. The timeline for registration in the program ended March 29. Selection of vendors takes place through April 30, when small businesses find out if they were accepted. The Economic Seminar was the first of its kind for the Tribe. Smith said he and Chairman Marcellus W. Osceola Jr. hoped to host more such events in the future for the Tribe’s small businesses. Meanwhile, the Seminole Tribe of Florida, Inc. (STOFI) rolled out a new process earlier this year – Potential Business Opportunities, or PBO. PBO incorporates a set of guidelines and requirements for Tribal members and non-Tribal members who want to officially pitch their business ideas to the board. The process is led by Golden Johansson, executive director of operations for STOFI. Ideas that could be considered include small franchises, partnerships or joint ventures, a restaurant concept or maybe a private label brand for certain products. The PBO process covers Seminole Tribal operations, not those of Hard Rock International. Those who visit the STOFI website (stofinc.com) and click on “Business Opportunities” will see the program’s goals and intentions, including some ideas the board will not entertain. The process begins by emailing application materials to pbo@semtribe.com. Go to miasbliv.com for more information about the NFL’s Business Connect program or contact Thomas at (786) 907-4316. You can access Broward County programs through broward.org.